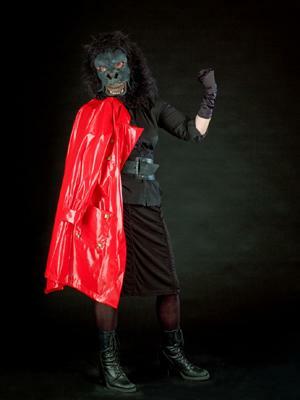 The Guerrilla Girls, featured in !WOMEN ART REVOLUTION, a film by Lynn Hershman Leeson. A Zeitgeist Film release. Photo courtesy of Orange Photography, San Francisco. March 2, 2012 at 7:00 p.m.
Gallery 1C03 and the Institute for Women's and Gender Studies (IWGS) proudly co-present the ground-breaking new film on the feminist art movement !Women Art Revolution (!W.A.R. ), directed by Lynn Hershman Leeson. An entertaining and revelatory "secret history" of Feminist Art, !W.A.R. deftly illuminates this under-explored movement through conversations, observations, archival footage and works of visionary artists, historians, curators and critics compiled over the last 40 years. Filmmaker and artist Hershman Leeson collected a plethora of interviews with her contemporaries, including Guerilla Girls, Judy Chicago, Yoko Ono, Cindy Sherman, Barbara Kruger, Carolee Schneemann, Miriam Schapiro, Marcia Tucker and countless other groundbreaking figures and shaped them into an intimate portrayal of their fight to break down barriers facing women both in the art world and society at large. The film screening will be followed by a panel discussion on feminist art with Roewan Crowe, Shawna Dempsey, and Tasha Hubbard.